This page contains information about how to obtain a passport at the Department of Foreign Affairs (DFA) Regional Consular Office at Robinson's Place, Lipa City, Batangas. Before proceeding, please take a moment to read this announcement that was posted outside the consular office. Kindly note that this web site is NOT in any way connected with the DFA and this article is posted as a public service. The information contained herein MAY CHANGE over time, so kindly consider the date of this posting which may be seen near the top of this article. Finally, the author does not have the time to respond to all questions or clarifications; but you may post yours anyway and hope that others who have undergone the application will take time to reply. 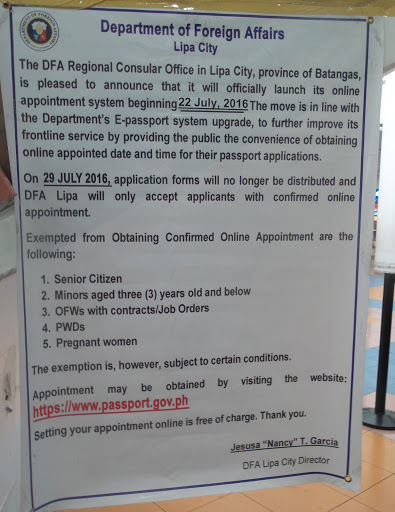 “The DFA Regional Consular Office in Lipa City, Province of Batangas, is pleased to announce that it will officially launch its online appointment system beginning 22 July 2016. The move is in line with the Department’s E-passport system upgrade, to further improve its frontline service by providing the public the convenience of obtaining online appointment date and time for their passport applications. On 29 July 2016, application forms will no longer be distributed and DFA Lipa will only accept applicants with confirmed online appointments. The exemptions are, however, subject to certain conditions. Setting your appointment online is free of charge. Thank you. The procedure below is condensed from official procedure posted outside the DFA Regional Consular Office at Robinson's Place, Lipa City. This is the procedure that is to be followed by those who have obtained online appointments at the consular office. 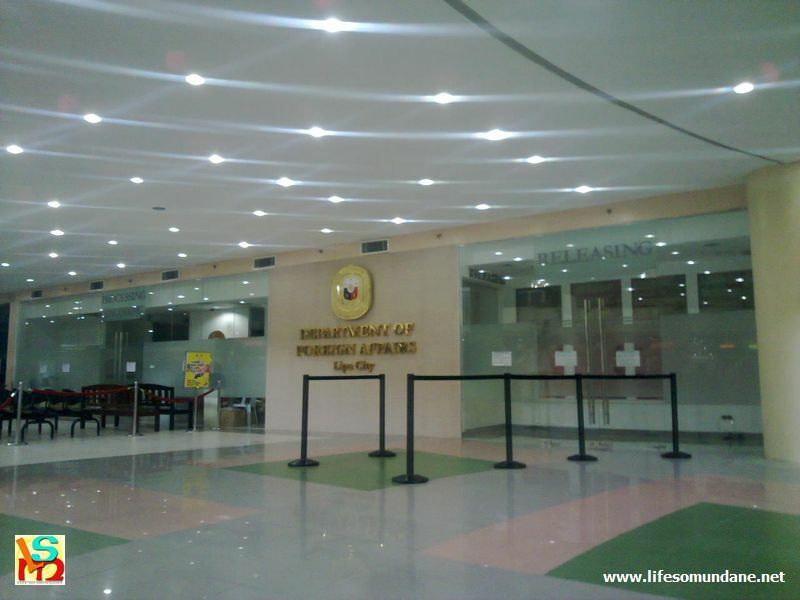 The information contained below has been taken from documents posted outside the Consular Office of the DFA at Robinson's Place, Lipa City, Batangas. Birth certificate in security paper issued by the NSO. Marriage contract in security paper issued by the NSO (for married women only). Certified True Copy/Transcribed Copy of birth/marriage certificate when entries in NSO BC/MC are blurred or not readable. NOTE: All documents are subject to checking and approval of the processor. The Department may require additional documents as may be necessary. ID (School ID/Form 137) of minor 8-17 years old for first time and renewal applicant. Affidavit of support and consent indicating the name of travelling companion. If minor is illegitimate, mother should execute the ASC. Affidavit of support and consent indicating the name of travelling companion. With attached copy of valid passport of parents and MUST BE AUTHENTICATED BY THE NEAREST PHILIPPINE EMBASSY OR CONSULATE. Commonly referred to as "red ribbon." Special Power of Attorney designating the representative by name and authorizing him to apply for the minor's passport and must be AUTHENTICATED BY THE NEAREST PHILIPPINE EMBASSY OR CONSULATE. Copy of valid passport(s) of either or both parent(s). Original ID of the duly authorized representative. Amended NSO Birth Certificate reflecting surname of father with acknowledgment and consent to use the surname of the father. Annotated Birth Certificate from the NSO regarding the new status as legitimated and the full name of the child correctly stated. Old passport and photocopies of passport pages 1, 2, 3, 4 and last. Birth certificate from NSO to determine the complete middle name. Original green passport and photocopies of first and last pages. Original passport and photocopies of first and last pages. Birth certificate from NSO to determine the complete place of birth or old cancelled may be presented in the absence of the NSO Birth Certificate. Marriage contract issued by the NSO. Marriage contract from the Local Civil Registrar when entries in the NSO copy is blurred and not readable. NSO Death Certificate of Husband (for widows who wish to revert to their single names).